The Centennial State of Colorado has some incredibly diverse and road-accessible geology contained within its borders. Partially due to its altitude, dry climate, and geographic location straddling the Great Plains, the Rocky Mountains, and Plateau belt of the midwestern U.S., numerous opportunities to explore the Earth’s history recorded in its rocks and fossils are available. 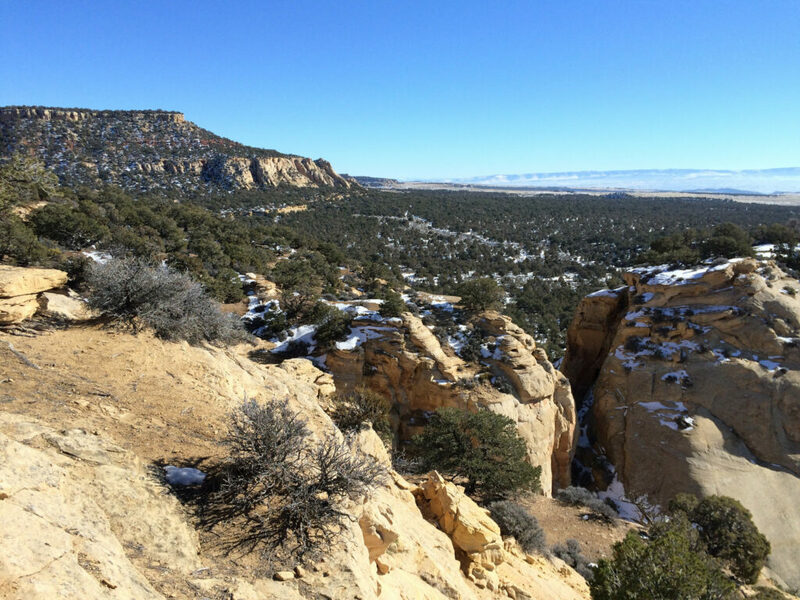 Located in the northwest corner of Colorado on the Utah border, Dinosaur National Monument holds preserved fossil records of over 1,500 of the dinosaurs that roamed the continent. 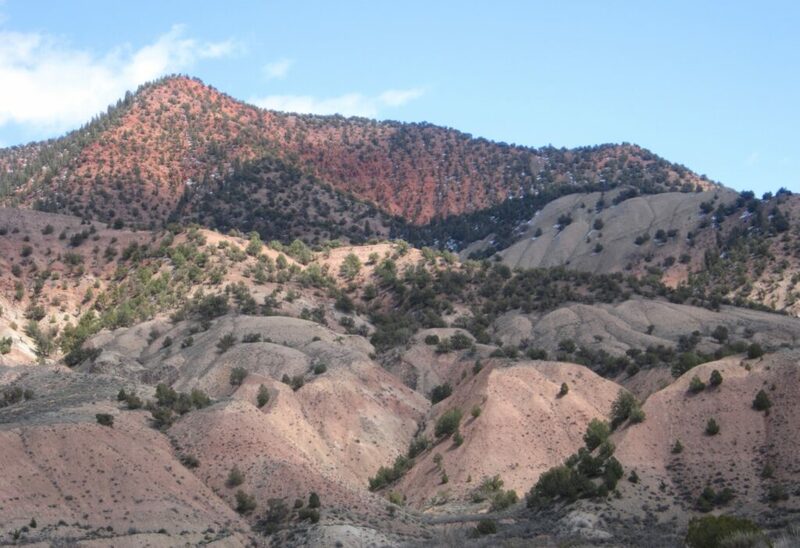 The fossils are preserved in the red beds of the Morrison Formation—known to be the most prolific source of Jurassic-age dinosaur fossils in North America. This formation of large mudstones, sandstones, and siltstones was deposited by rivers and flood events about 155 to 145 million years ago. Throughout time, these deposits formed into rocks, uplifted when the Rocky Mountains were formed, and subsequently cut into canyons and mesas by rivers and streams, exposing the rocks and fossil records they hold. The Centerpiece of the Dinosaur National Monument visitor center houses research facilities, a bookstore, and excavation center. Guided tours and evening talks are available as well. There are five RV-friendly campgrounds within the Dinosaur National Monument with reservations available at the Green River campground and Split Mountain campground in Utah (the others are first-come spots). The Dotsero Volcano sits just north of the Colorado River and Interstate 70 between the towns of Gypsum and the Glenwood Canyon. Dotsero Volcano is the youngest volcano in Colorado and although it appears dormant, it is still considered by USGS to be an active volcano with a moderate threat potential. The crater is about half-mile wide and 600-feet deep, set in the sandstones of Western Colorado. A hike of about 3 miles each way with a significant elevation gain of just under 2,000 feet on the Dotsero-Ute Trail will get you to the crater. 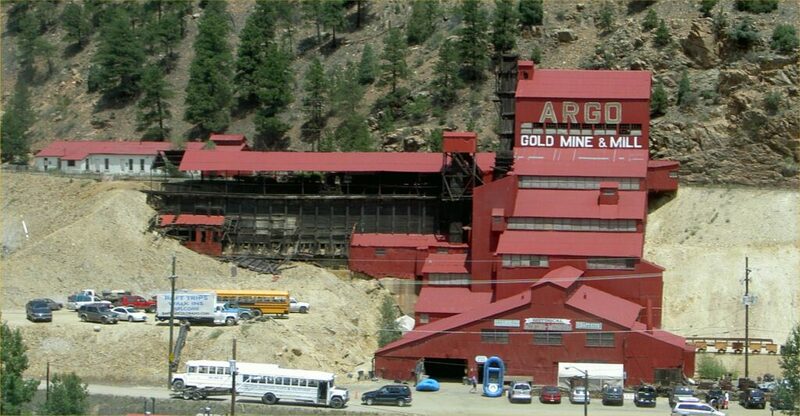 The Argo mine tunnel in Idaho Springs was completed in 1910 and extends over 4 miles into the heart of the Colorado Mineral Belt. This tunnel provided drainage to many of the other mines in the area until 1943, and the chemical-laden discharge now requires the ongoing treatment and monitoring of the water before it enters Clear Creek. The mill was built at the entrance of the tunnel and was used to process mined gold ore. The mill is part of the National Register of Historic Places and is open for tours year-round. At the head of the San Luis Valley in south-central Colorado sit the Great Sand Dunes. This 30-square mile dune field contains over 5 billion tons of sand and the tallest dunes in North America (750 feet). Great Sand Dunes is framed by the backdrop of the Sangre de Cristo Mountains with the Crestone Needle (14,197 ft) to the north and Blanca Peak (14,345 ft) and Mt. Lindsey (14,042 ft) to the south. 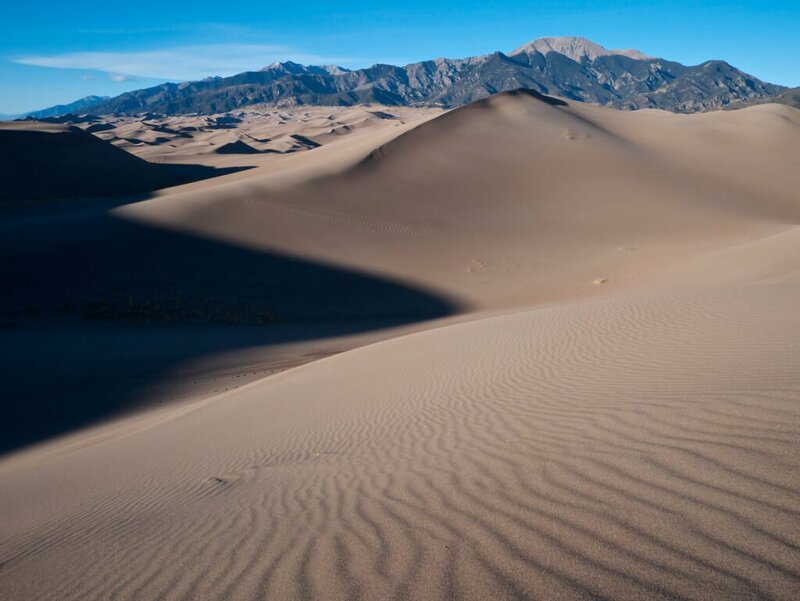 The Sand Dunes provide both hiking and four-wheel driving routes, as well as on-site camping at the Piñon Flats Campground. For those interested in additional places of geologic interest in Colorado, visit the Colorado Geological Survey’s POGI map and articles for more ideas!